Kelly KDS programmable small series/PM motor controller provides efficient, smooth and quiet controls for electrical tricycle, electric motorcycle, pump motor, and industry motor speed control. Motor speed controller uses high power MOSFET, synchronous rectification, fast PWM to achieve high efficiency. Powerful microprocessor brings in comprehensive and precise control to brushed motor controllers. This programmable motor brushed controller also allows users to set parameters, conduct tests, and obtain diagnostic information quickly and easily. 5. "E" represents high efficiency. 2. .36V model: range of the max operating voltage is 18-45V. 3. 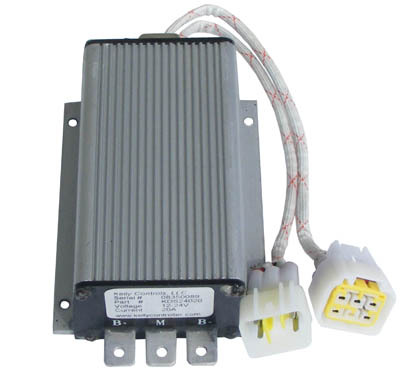 48V model: range of the max operating voltage is 18-60V. 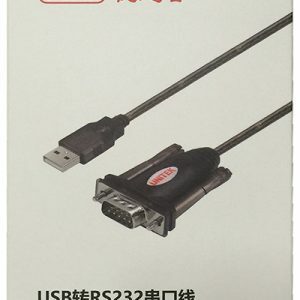 Male or female connectors matching KDS controller is included. Provide power supply (5V) for hall sensors and other sensors. Synchronous rectification, ultra low drop, and fast PWM to achieve very high efficiency. Voltage monitoring on voltage source 12V and 5V. Battery protection: current cutback, warning and shutdown at configurable high and low battery voltage. Rugged aluminum housing for maximum heat dissipation and harsh environment. Rugged high current terminals, and rugged aviation connectors for small signal. Thermal protection: current cut back, warning and shutdown on high temperature. Configurable high pedal protection: the controller will not work if high throttle is detected at power on. Main Contactor Coil Drive, 2A. Standby Current: less than 3mA. 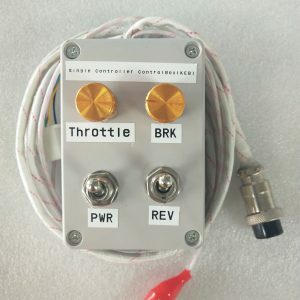 Throttle Input: 0-5 Volts. Potential meters can be used to produce 0-5V. Full Power Operating Temperature Range: 0℃ to 50℃ (controller case temperature). Operating Temperature Range: -30℃ to 90℃, 100C shutdown (controller case temperature).